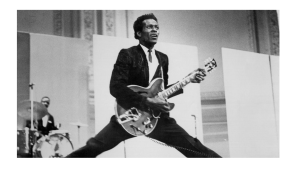 It’s almost impossible to think of this world without Chuck Berry in it, but it’s even more difficult to think of a world without his music. Fortunately, we won’t have to do that because Chuck Berry’s musical will live forever. The spirit of freedom, of adventure and the fresh discovery of life pour through his every note and every song. Possibility, romance and risk are at every turn. Like Maybelline coming over the hill, Chuck’s music is the sound of beating the odds. Poetry and rhythm, nuanced observation, heartfelt love for a child, a memory, a dream… All this and more live inside a Chuck Berry song. He did deliver us from the days of old… We can’t go back… We can’t undo Rock and Roll… Thank you King Charles Edward Berry for your service to the loving people of this world… Your spirit will reign all of our days.